Overt Enemy is an American Thrash Metal band established in 2013 and based in Mission Texas USA. They perform their own brand of original Texas Thrash Metal and the best Slayer Tribute in North America. Overt Enemy released their debut EP “Inception” via Confused Records in July 2018 and is currently in the Top 15 metal bands worldwide on Reverbnation’s Global Metal Chart. 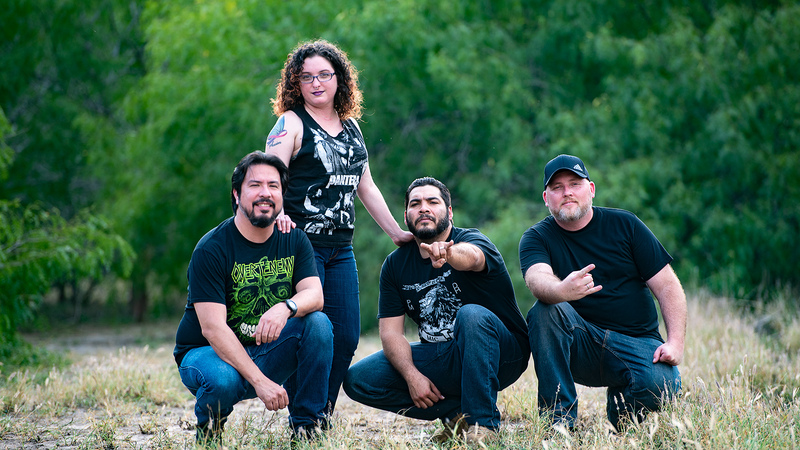 Overt Enemy’s original music was featured in the 2016 horror film “The Blood Tapes” (now available on Amazon.com) and their latest single “Political Cancer” has received consistent airplay on radio stations such as KFRQ 94.5FM and internet radio stations like RGV Titan Radio. Overt Enemy has a rabid fanbase that expands with every performance. They have shared the stage with acts like Confused, Panteon, X.I.L, Severance, Sons of Texas and are currently in the studio recording the follow-up to their debut EP with producer/engineer Joshua Lopez (Immortal Guardian) at Widowmaker Studios in McAllen TX..